Traditional aquarium designs rarely look good on office space. Office spaces usually require esthetically sound aquarium designs. And if we look at those cheap aquarium tanks available in market then we can see that they’re not pleasant in viewing from multiple angles. 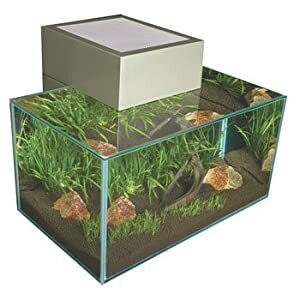 So if you’re looking for 3D cube design of aquarium then fluval aquarium set can be a good choice. If you’re buying aquarium set for your office then aesthetic is very important. This is because you’re going to keep aquarium at the center of office or at the corner or perhaps attached to the wall. No matter how you keep the aquarium you’ll find that aesthetic is very important. Besides that if the room has place to seat for more than 4 people at different parts of the same room then cube setup is very essential as it allows you to view the aquarium from various angels. 3D cube designs these days allows high definition of viewing your aquarium. With Fluval edge you get all your aesthetic requirements fulfilled. You don’t need to worry about quality of glass and aesthetics. This aquarium tank set comes up with the hidden filtration system so that you don’t have to invest in filtration separately. This set gives you 3 set of filtration. If you’re not satisfied with the current filtration system in the set then you can replace it with your specific filter set. Because of the hidden wiring in this set you’ll find the sleek look of this tank. You can use fluval algae magnet and carbon clear sachet with this set. Though you don’t have to use these of fluval if you don’t want but the filter design has it’s specification for some products so you end up purchasing those things anyway. Algae magnet and the carbon sachet are not expensive. You can buy them for about 12$ from the market either online or offline. This set has simple assembly and you’ll find it easy to setup the aquarium tank. All you have to worry about it is the location for the tank. What’s not enough with this set ? There are few things that you’ll find that are not enough with this set. So let’s take a look at them one by one. No Heater – There is no heater available with this set. You need to get one for this set in order to keep few specific fish which requires variation of temperature. Difficult to Clean – Design of the set is such that you’ll find the set hard to clean. So choose the fish in your aquarium carefully in order to avoid tank getting filled with waste. You can add those algae & waste cleaner fishes in tank as well. But i suggest you to choose fish with low cleaning maintenance. Lights- You’ll get only two halogen lights with this set. These are not sufficient for your aquarium. You can add one more but that will affect the looks of the tank. If you are going to add plants to this set then you’ll find this limitation a bit turned off. What fishes to choose ? As per the product description of this set they suggest you to keep goldfish. But goldfish create a lot of waste and grow quickly in the tank, so that will require more maintenance on your end. To avoid the maintenance,you can choose suckermouth catfish, clown loach, neon tetras and angelfish. Avoid placing betta if you’re planning to add more than 3-4 fishes. This tank is also suitable for invertebrate-only setup but you need to take care of lights if you’re serious about this setup. Overall- If you’re not going to keep plants in your tank and don’t mind little maintenance then fluval can be a good option for your office space or room. You’ll have to do few adjustments to current set to personalize as per your needs but it’s worth that trouble. Buy at Amazon Fluval Edge 6 Gal. Aquarium Set Pewter.